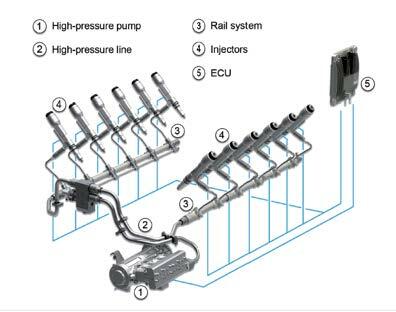 By far the greatest advancement over the past 10 years in engine design has been the development of the High Pressure Common Rail (HPCR) fuel injector. These remarkable devices have been the cornerstone for advances in combustion efficiency and allow an engine to achieve the stringent new emissions levels proposed by the engine Tier ratings. While the HPCR fuel injector is a more recent development in engine design, the concept of common rail fuel injection is not. In fact, common rail fuel injection has been around in a basic form since the early 1920’s. Modern HPCR fuel injection systems are practically simple in their overall design, however, they comprise a number of highly complex interacting key components in order to function reliably and efficiently. The main HPCR components are listed and illustrated in the image below. Unlike older Electronic Unit Injector (EUI) designs, the HPCR fuel injector does not develop its own pressure during engine operation. The pressure for injection is developed by the high-pressure fuel pump (1), which is mechanically operated by the engine. A common fuel rail (3) connects each injector from the fuel pump; hence where the terminology of Common Rail originated. The design of this system is such that a constant fuel pressure is available at the injector 100% of the time during engine operation thus providing a higher available mean time injection pressure over EUI designs. This feature ensures that fuel droplets are atomized the moment they leave the injector nozzle. As EUI systems must develop the fuel pressure during the injection event, they have a tendency to form larger droplets at the start and end of each injection event. HPCR injection systems are also able to regulate fuel injection pressure based on engine requirements, speed, and duty using the engine ECU combined with the fuel pump. The modern HPCR fuel injector is unlike its EUI predecessor, and to understand why they are more susceptible to contamination related problems, it is important to appreciate how they function during engine operation. Unlike EUI systems, which typically inject fuel once or twice per engine revolution, HPCR fuel injectors can provide up to 5 injection events per single compression stroke of the engine. Putting this into perspective, with a large high-speed diesel engine operating at 1400 RPM, the fuel injector is capable of injecting fuel into the combustion chamber in varying quantities depending on the ECU outputs, up to 1,750 times per minute, or 29 times per second with the fuel exiting the injector tip at speeds in excess of 700 miles per hour.